Objective To determine whether the use of angiotensin converting enzyme inhibitors (ACEIs), compared with use of angiotensin receptor blockers, is associated with an increased risk of lung cancer. Setting United Kingdom Clinical Practice Research Datalink. Participants A cohort of 992 061 patients newly treated with antihypertensive drugs between 1 January 1995 and 31 December 2015 was identified and followed until 31 December 2016. Main outcome measures Cox proportional hazards models were used to estimate adjusted hazard ratios with 95% confidence intervals of incident lung cancer associated with the time varying use of ACEIs, compared with use of angiotensin receptor blockers, overall, by cumulative duration of use, and by time since initiation. Results The cohort was followed for a mean of 6.4 (SD 4.7) years, generating 7952 incident lung cancer events (crude incidence 1.3 (95% confidence interval 1.2 to 1.3) per 1000 person years). Overall, use of ACEIs was associated with an increased risk of lung cancer (incidence rate 1.6 v 1.2 per 1000 person years; hazard ratio 1.14, 95% confidence interval 1.01 to 1.29), compared with use of angiotensin receptor blockers. Hazard ratios gradually increased with longer durations of use, with an association evident after five years of use (hazard ratio 1.22, 1.06 to 1.40) and peaking after more than 10 years of use (1.31, 1.08 to 1.59). Similar findings were observed with time since initiation. Conclusions In this population based cohort study, the use of ACEIs was associated with an increased risk of lung cancer. The association was particularly elevated among people using ACEIs for more than five years. Additional studies, with long term follow-up, are needed to investigate the effects of these drugs on incidence of lung cancer. Thus, in light of the conflicting and limited evidence from both preclinical and observational studies, we conducted a large, population based study to determine whether the use of ACEIs, compared with use of angiotensin receptor blockers, is associated with an increased risk of lung cancer. 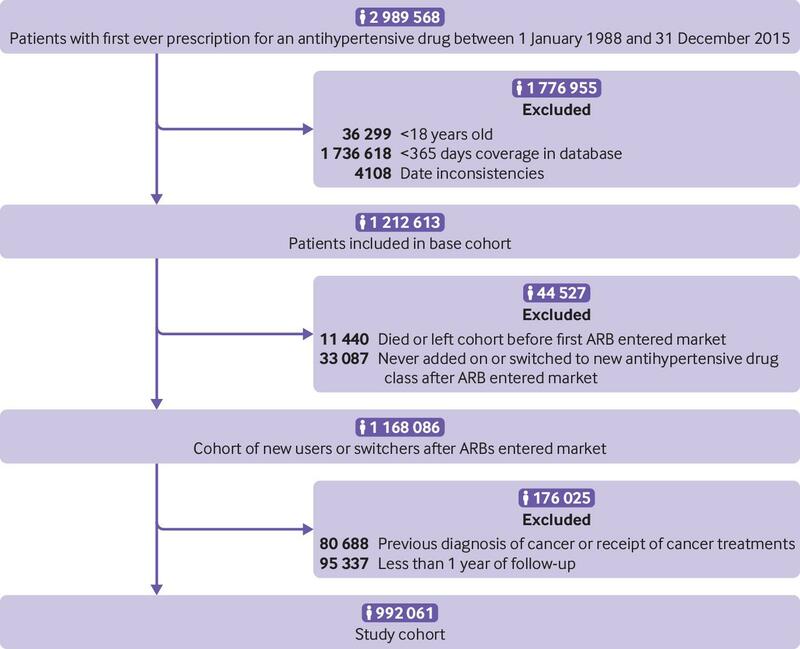 From the base cohort defined above, we identified a study cohort of all patients who started taking a new antihypertensive drug class on or after 1 January 1995 (the first year in which both ACEIs and angiotensin receptor blockers were available in the UK) until 31 December 2015. These patients included those newly treated with an antihypertensive drug class (that is, first ever antihypertensive prescriptions) as well as those who added on or switched to an antihypertensive drug class not previously used in their treatment history. We defined cohort entry as the date of this first prescription. We excluded patients with a previous diagnosis of any cancer (other than non-melanoma skin cancer) and those who had received treatments for cancer (chemotherapy or radiotherapy) at any time before cohort entry. This was to ensure the identification of incident cases of lung cancer during follow-up and to avoid the inclusion of patients with metastatic lesions to the lung from other cancer sites. Finally, we excluded patients with less than one year of follow-up after cohort entry for latency considerations and to ensure the identification of incident events during follow-up. We followed up all patients who met the study inclusion criteria, starting one year after cohort entry, until a diagnosis of incident lung cancer (identified on the basis of Read codes; supplementary table A) or censoring on death from any cause, end of registration with the general practice, or the end of the study period (31 December 2016), whichever occurred first. We did three secondary analyses. Firstly, we assessed whether a duration-response relation existed between cumulative duration of ACEI use and incidence of lung cancer. For this time dependent analysis, we estimated hazard ratios in a time dependent manner for three predefined duration categories: five years or less, 5.1-10 years, and longer than 10 years. Secondly, we investigated the association between time since starting ACEIs and risk of lung cancer, estimating hazard ratios for three predefined categories: five years or less, 5.1-10 years, and longer than 10 years. We also modeled cumulative duration of use and time since initiation as continuous variables, using restricted cubic spline models with five knots to produce a smooth curve of the hazard ratio as a function of duration.3132 To investigate possible effect modification by smoking status, we included an interaction term between the exposure and smoking status variables. Additionally, we repeated the primary and secondary analyses among non-smokers. We did two ancillary analyses to consider the possibility that angiotensin receptor blockers may be associated with a decreased risk of lung cancer incidence.37 The first compared ACEIs with thiazide diuretics, as the latter have not been previously associated with lung cancer incidence. For this analysis, we redefined exposure hierarchically into four mutually exclusive categories: ACEIs (alone or in combination with other antihypertensive drugs, but no previous use of thiazide diuretics or angiotensin receptor blockers), thiazide diuretics (alone or in combination with other non-ACEI or non-angiotensin receptor blocker antihypertensive drugs), angiotensin receptor blockers (alone or in combination with other non-ACEI or non-thiazide antihypertensive drugs), and other antihypertensive drugs. The second analysis compared angiotensin receptor blockers with thiazide diuretics to assess whether the former are associated with a decreased risk of lung cancer. For this analysis, we redefined exposure hierarchically as angiotensin receptor blockers (alone or in combination with other antihypertensive drugs, but no previous use of thiazide diuretics or ACEIs), thiazide diuretics (alone or in combination with other non-ACEI or non-angiotensin receptor blocker antihypertensive drugs), ACEIs (alone or in combination with other non-angiotensin receptor blocker or non-thiazide antihypertensive drugs), and other antihypertensive drugs. For both analyses, we assessed the association overall and by cumulative duration of use. We used SAS version 9.4 and R for all analyses. Our study was a secondary data analysis and did not include patients as study participants. No patients were involved in setting the research question or the outcome measures, nor were they involved in the design and implementation of the study. There are no plans to involve patients in the dissemination of results, nor will we disseminate results directly to patients, beyond our general media communications plan. The cohort included 992 061 patients (fig 1) followed for a mean of 6.4 (SD 4.7) years beyond the one year post-cohort entry latency period. During the follow-up period, 335 135 patients were treated with ACEIs, 29 008 with angiotensin receptor blockers, and 101 637 with both ACEIs and angiotensin receptor blockers. The three most commonly used ACEIs were ramipril (26%; 257 420 patients) lisinopril (12%; 120 641 patients), and perindopril (7%; 70 955 patients). Overall, 7952 patients were newly diagnosed as having lung cancer during 6 350 584 person years of follow-up, generating a crude incidence rate of 1.3 (95% confidence interval 1.2 to 1.3) per 1000 person years. Table 1 shows baseline characteristics of the entire cohort and by use of ACEIs, angiotensin receptor blockers, and other antihypertensive drugs at cohort entry. Compared with angiotensin receptor blocker users, ACEI users were more likely to be male, to have alcohol related disorders, to be current smokers, and to have a higher body mass index. Additionally, ACEI users had a shorter duration of treated hypertension and were more likely to have used statins and other prescription drugs. ACEI and angiotensin receptor blocker users had a similar history of pneumonia, tuberculosis, and chronic obstructive pulmonary disease. Table 2 shows the results from primary and secondary analyses. Compared with angiotensin receptor blockers, ACEIs were associated with an overall 14% greater risk of lung cancer (1.6 v 1.2 per 1000 person years; hazard ratio 1.14, 95% confidence interval 1.01 to 1.29). In secondary analyses, the use of ACEIs for less than five years was not associated with an increased risk of lung cancer (hazard ratio 1.10, 0.96 to 1.25). However, the hazard ratio was elevated with five to 10 years of use (1.22, 1.06 to 1.40) and continued to increase with more than 10 years of use (1.31, 1.08 to 1.59). Similar associations were observed for time since starting ACEI, with hazard ratios increasing with longer times since initiation, peaking at more than 10 years since initiation (hazard ratio 1.29, 1.10 to 1.51). We saw similar patterns in analyses using restricted cubic splines (supplementary figures A and B). Smoking status did not significantly modify the association between ACEI use and risk of lung cancer (P for interaction=0.40; supplementary table B). Supplementary table C shows analyses conducted within non-smokers. Overall, the results were consistent with those of the primary analyses, with the hazard ratio increasing with longer cumulative durations of use (>10 years cumulative use: hazard ratio 1.64, 1.02 to 2.64). Results of sensitivity analyses are summarized in figure 2 and supplementary tables D-G. Overall, these yielded consistent results, generating hazard ratios ranging between 1.13 and 1.22. The latter estimate was from the marginal structural model that controlled for potential time dependent confounding. Compared with the use of thiazide diuretics, the use of ACEIs was associated with a 6% increased risk of lung cancer (hazard ratio 1.06, 1.00 to 1.13) (supplementary table H). Similar to the main analysis, use of ACEIs for less than five years was not associated with an increased risk of lung cancer, whereas hazard ratios were elevated with increasing use, peaking with more than 10 years of use (1.23, 1.04 to 1.44). Analysis comparing angiotensin receptor blockers with thiazide diuretics showed null associations overall (hazard ratio 0.93, 0.82 to 1.06) and by cumulative duration of use (supplementary table I). In this large population based study of nearly one million patients, the use of ACEIs was associated with an overall 14% increased risk of lung cancer. Associations were evident after five years of use and increased with longer durations of use, particularly among patients who used ACEIs for more than 10 years (31% increased risk). Although the magnitudes of the observed associations are modest, ACEIs are one of the most widely prescribed drug classes; in the UK, 70.1 million antihypertensives are dispensed each year, of which approximately 32% are ACEIs.3839 Thus, small relative effects could translate into large absolute numbers of patients at risk for lung cancer. Given the potential impact of our findings, they need to be replicated in other settings, particularly among patients exposed for longer durations. This study has some limitations. Firstly, although we were able to adjust for several important confounders, this study lacked information on other potential confounders such as socioeconomic status, diet, exposure to radon or asbestos, and family history of lung cancer.5152 Additionally, despite adjusting for smoking status, we lacked detailed information on duration and intensity of smoking, which have been shown to be associated with lung cancer incidence.5152 However, an analysis conducted within non-smokers produced results consistent with those of the primary analyses, with a clear duration-response association, providing reassurance that residual confounding by smoking did not materially affect our findings. Secondly, prescriptions in the CPRD represent those written by general practitioners, so misclassification of exposure is possible if patients did not adhere to the treatment regimen or received prescriptions from specialists. However, as all patients entering the cohort were those newly treated with antihypertensive drugs, misclassification due to non-adherence should be minimal and likely non-differential between ACEI and angiotensin receptor blocker users. Thirdly, we compared ACEIs with angiotensin receptor blockers, as the latter also act on the renin-angiotensin system and are used at the same disease stage but have not been associated with neuropeptide accumulation in the lung. However, angiotensin receptor blockers may also have an effect on lung cancer incidence,53 and a meta-analysis of observational studies reported a decreased risk with these drugs.37 Studies included in this meta-analysis had some limitations, and several compared angiotensin receptor blockers with ACEIs.37 Thus, the apparent protective effect of angiotensin receptor blockers may be the result of a deleterious effect of ACEIs on lung cancer incidence.37 Nevertheless, our study was designed to consider this possibility by comparing ACEIs with thiazide diuretics in ancillary analyses. Reassuringly, this analysis yielded consistent results, both in terms of overall association and by cumulative duration of use. Importantly, our analyses comparing angiotensin receptor blockers with thiazide diuretics produced null associations for both overall and cumulative duration of use; this suggests that the observed increased risk with ACEIs is unlikely to be attributable to the purported antitumor effects of angiotensin receptor blockers. Fourthly, misclassification of the outcome is possible; however, lung cancer has been shown to be well recorded in the CPRD when compared with the UK National Cancer Data Repository (concordance rate of 93%).23 Associations may also vary by subtypes of lung cancer, but this information was not available within the CPRD. In this large, population based study, the use of ACEIs was associated with an elevated risk of lung cancer overall, along with evidence of a duration-response relation. Although the magnitudes of the observed estimates are modest, these small relative effects could translate into large absolute numbers of patients at risk for lung cancer, so these findings need to be replicated in other settings. Contributors: All authors conceived and designed the study, analyzed and interpreted the data, and critically revised the manuscript for important intellectual content. LA acquired the data. BMH, HY, and LA did the analyses. BMH wrote the manuscript, and all authors participated in the interpretation of the results and critical revision of the manuscript. The corresponding author attests that all listed authors meet authorship criteria and that no others meeting the criteria have been omitted. LA is the guarantor. Funding: This study was funded by a Foundation Scheme grant from the Canadian Institutes of Health Research. BMH holds a Cancer Research UK population research fellowship. KBF holds a chercheur-boursier junior 2 award from the Fonds de recherche du Québec – Santé (FRQS) and is the recipient of a William Dawson scholar award from McGill University. JAU holds a Heart and Stroke Foundation of Canada national new investigator/Ontario clinician scientist (phase I) award. LA holds a chercheur-boursier senior award from the FRQS and is the recipient of a William Dawson scholar award from McGill University. The funding source had no influence on the design and conduct of the study; collection, management, analysis, and interpretation of the data; preparation, review, or approval of the manuscript; or the decision to submit the manuscript for publication. Competing interests: All authors have completed the ICMJE uniform disclosure form at www.icmje.org/coi_disclosure.pdf (available on request from the corresponding author) and declare: this study was funded by the Canadian Institutes of Health Research; JAU has participated in research projects funded by AstraZeneca, Janssen, Novartis, and Sanofi and received personal consultancy fees and honorariums for symposia from Amgen, AstraZeneca, Boehringer-Ingelheim, Janssen, Merck, Novartis, and Sanofi; these have no relation to the work presented in this manuscript; no other relationships or activities that could appear to have influenced the submitted work. Ethical approval: The study protocol was approved by the Independent Scientific Advisory Committee of the Clinical Practice Research Datalink (protocol number 16_255R) and by the Research Ethics Board of Jewish General Hospital, Montreal, Quebec, Canada. Transparency: The guarantor affirms that this manuscript is an honest, accurate, and transparent account of the study being reported; that no important aspects of the study have been omitted; and that any discrepancies from the study as planned (and, if relevant, registered) have been explained. National Health Service. Read Codes. 2017. https://digital.nhs.uk/services/terminology-and-classifications/read-codes. NHS Business Services Authority. Dictionary of medicines and devices. 2017. https://www.nhsbsa.nhs.uk/pharmacies-gp-practices-and-appliance-contractors/dictionary-medicines-and-devices-dmd. National Institute for Health and Care Excellence. Hypertension in adults: diagnosis and management. 2016. https://www.nice.org.uk/guidance/cg127/chapter/1-Guidance#initiating-and-monitoring-antihypertensive-drug-treatment-including-blood-pressure-targets-2.
. Analysis of Incomplete Multivariate Data.Chapman and Hall, 1997doi:10.1201/9781439821862.
. Multiple Imputation for Nonresponse in Surveys.John Wiley & Sons, 1987doi:10.1002/9780470316696. National Health Service Digital. Prescriptions Dispensed in the Community - Statistics for England, 2004-2014. 2015. https://digital.nhs.uk/catalogue/PUB17644.